Oct 26'15 85% mall wide revamp done!Hooray! Pages have been revamped. Next is the new banners! Will be released by Friday! Are you all ready? Congratulations to Rhonda (xrhondamarie) as she moves up from the Academy to Sapphire Branch Food &ampamp; Drinks. Please make sure to update your banners! Oct 23'15 65% mall wide revamp done! Have you seen the other pages already? Only few more to go!For the meantime let's welcome 2 new members! Shelsie(just_lil_ol_me_again) for Sapphire wearables and Emily (myhijh) for Ruby Food & Drinks. Also Sharon (sharbes1027) will be taking Amethyst Petpets. So please make sure to update your banners! Oct 5'15 Thank you so much everyone for the prompt replies and active members! Already did member sweep! Welcome back to Mikey(thorll777) for Diamond Books and Ashley(green_goblins) for Ruby petpets. Pls update your banners everyone! Announcing our SOTM. Ali (aliangel_3499), Micah (coxian), Britta(brittu), Marion (martrick6988), Seven(bunnyseven). 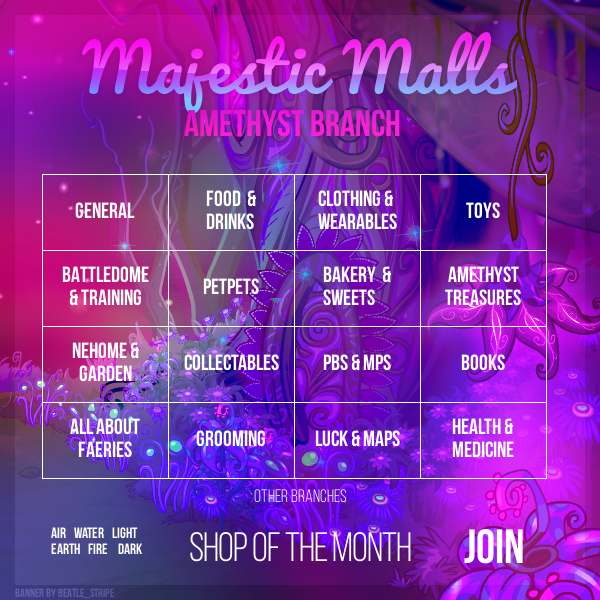 Sept 30'15 Banners updated, lets welcome 3 new members, Sarah (platdragon) Samantha (sa5mmm7) and Taryn (mermaid15243) for Amethyst Collectibels, Sapphire and Diamond Petpets. Page complete and made new board! Sept 18'15 90% revamp done! I'm looking for someone who can make mall banners! If you know someone please send me a mail. Giving follow ups on the applicants and members. Aug, 28'15 50% revamp done. We, the staff of Majestic Malls would like to thank everyone who stayed with us even through neos dark moments and semi-hiatus of the mall! Aug, 1 '15 Hi there! Cleared updates to lessen the loading time and heavy content will be making a new page full of archives with old stuff. The mall is still alive FYI, just ongoing revamp! will keep you guys updated! Majestic Malls was founded by Stacey(yay_thejonasbrothers) last September 14, 2012 and it was then endorsed to Brittany(mizzzvampire) as of year 2013. 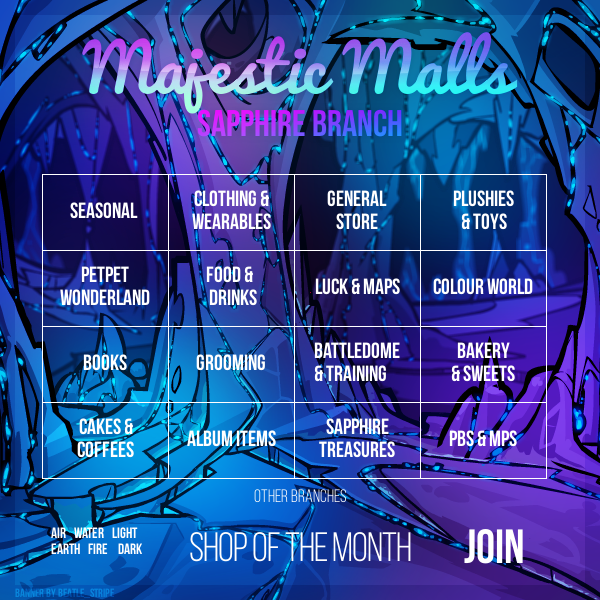 Due to college, Brittany has to face the fact that she'll be having a hard time to manage the malls thus endorsed to Clara(princessrawrmeow) and Joyables(excalibur_joy) along with a lot of changes and improvements for Majestic Malls. It just started with one branch, yet got full in 2 weeks time thus continue to have more branches! Growing and helping each other! There are five branches so far that was taken from beautiful gemstones along with it's unique and different categories in it. Now with a new added Academy for all shopkeepers that are under shop size 50 and our mall shopkeepers in the making as well!! 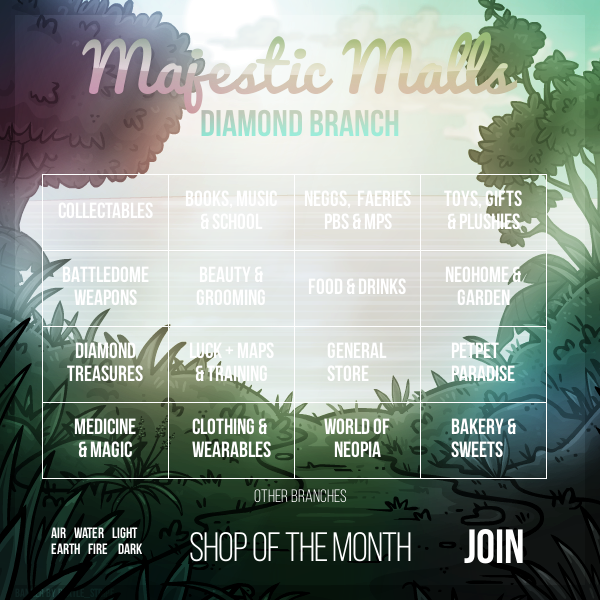 DIAMOND BRANCH established November 1, 2013! So what are the rules and requirements? -If your shop is under size 50, you want to join Majestic, and you plan to upgrade, you can ask to be put on our waiting list or you can join Majestic Academy :D .
2. You MUST have an updated banner and in your shop AT ALL TIMES. 2. The majority of your stock must be your category . We have garage sales monthly from the 25th of the month until the 3rd/Half Price Day to sell of all the non-categorical items. 3. NEVER have an empty shop. Keep at least one full page of stock while 2 pages for Diamond Branch. 4. If you plan on being offline for more than a few days, PLEASE LET US KNOW. 5. Failure on updating or unable to be online for 25 days time will be sent a message and if unable for another week, we are to remove you from the mall. As much as possible, please keep your status in Last Spotted not in stealth mode that we may see and monitor your logged in. 6. 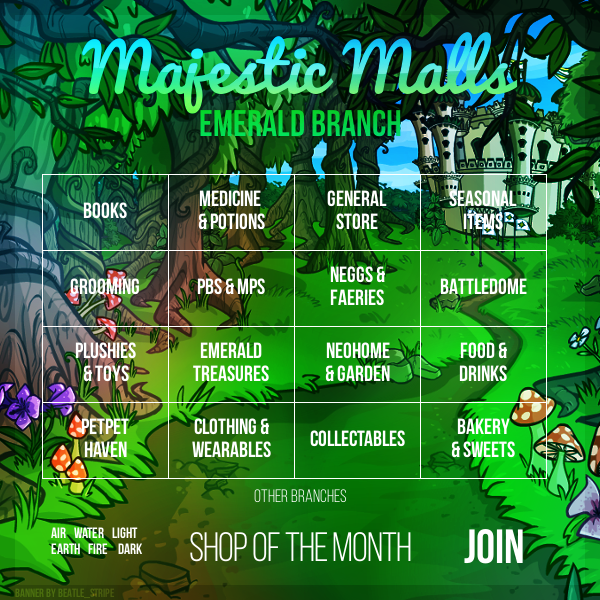 Shop of the Month will be decided according to your performance and rule abiding. So do your best! **If you are repeatedly warned for not following the rules, and you do nothing about it, you will be removed from the mall. **The waiting list is updated once in a while and neomailed once a spot is open. **The person will be removed when messaged to us that they don't want to join anymore or haven't replied to our neomails. It is a requirement in the mall that you place your banner in your shop at ALL times. Copy the code of your branch and paste it in your shop. Yes when notice board ad was still working we usually post weekly, but due to the transition, the Notice Board Ad hasn't been working since. However we still have our boards ready and saved up money from the members and left it untouched in the till. Here is the record of the SOTM, placed in table form to make it easier to view of course...Unable to place all records for the year of 2013 but tried the best we could to recover. The Golden Group offers shoppers a shopping experience like no other before! 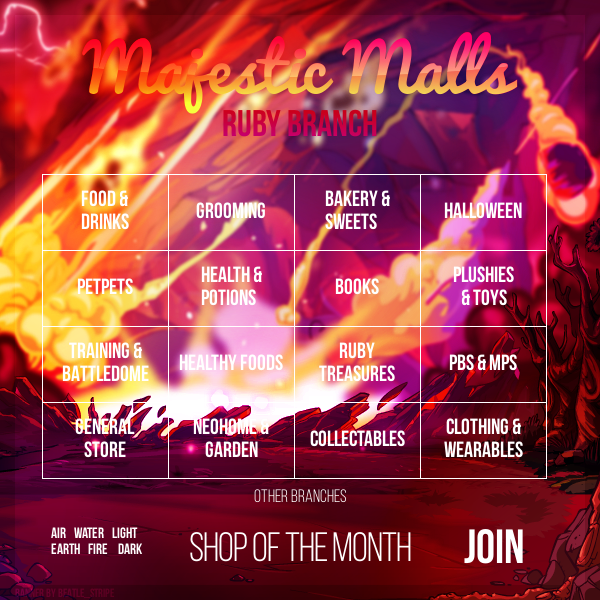 Founded by Richard last June 30, 2014, and became a sister mall with Majestic Malls supporting each other as one!